Yeah, we can’t get no - satisfaction about anything these days. Poor Charlie is all over the ‘media’. You know how they like to write about things that are important. It seems that Charlie has gone crazy. I think he is crazy like a fox! But as crazy as a Hollywood type can behave, the craziest, most bizarre behavior has nothing on the markets. Earthquakes, tsunamis, economic destruction, populous riots throughout the world, wars on every continent, US unemployment at 20% (front page of Investor’s Business Daily on 3/24/2011 - the real number), and yet nothing can bring forth a bear market in stocks. The Federal Reserve will not permit it. Let’s look at a microcosm of insanity. March 8, 2011 - “Overall, we believe these orders represent a positive data point for not only Pulte but also the broader homebuilding sector, and supports our view that demand continues to stabilize and slightly improve entering the current spring selling season,” said J.P. Morgan analyst Michael Rehaut. Now remember, Mr. Rehaut is an ‘analyst’. Remember also that he works for the bank that wants to rule the world - J.P. Morgan. Knowing what each of us knows about housing in our area, this guy is sounding a little ‘Charlie Sheen-ish’. March 23, 2011 - According to even our ‘Alice in Wonderland’ government, new home sales for February, 2011, fell to the lowest level on record. In case you are wondering, record keeping started in 1963. February 2011 sales were down 28% from February 2010 sales. As you might recall, 2010 sales were the previous ‘worst on record’ figures. Some analysts blamed bad weather. Others blamed the bulging inventory of foreclosed homes. Still others blamed the banks for tighter credit standards. Now, I don’t know what kind of drugs the whole world is on, but there must be a conspiracy to keep me out of the loop. I am stuck in reality while the rest of the world is exploring giant mushrooms or talking animals. For instance (from the preceding paragraph), did we not have bad weather last February? Weren’t the bad home sales last year blamed on bad weather for the previous February? Secondly, the foreclosures aren’t going away. They are multiplying. Thirdly, Dallas Fed President Fisher said this past week that there was a tremendous amount of liquidity ‘sloshing around the system’. The Fed is pumping money into the system by the hundreds of billions per month. To blame low sales on tighter credit standards is to blame poor ice cream sales at an anorexia nervosa clinic on just having one flavor. The simple truth is everybody is broke! We ain’t got no money to buy a stinkin’ house! Society is broke. No mas pesos. Is it going to get better? The worst ten months of sales on record have been the past ten months! The answer is ‘NO’!! Let’s get back to Charlie Sheen. While the goal of Hollywood is to draw attention, ol’ Charlie is teaching Madison Avenue a thing or two. Crazy behavior draws attention. But nothing could be crazier than the stock market. 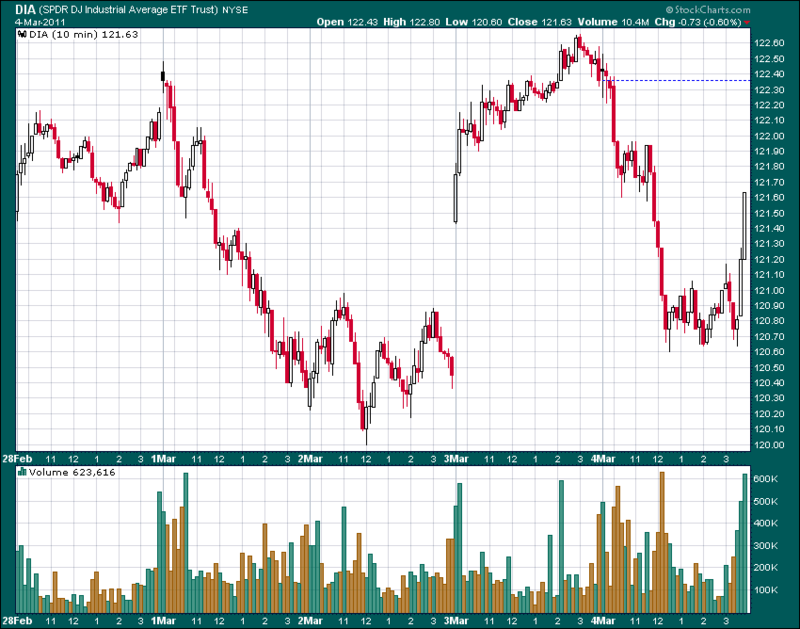 Given what I have just written on housing, let’s look at the housing ETF, ITB, shall we? 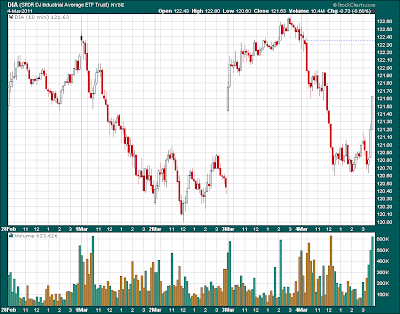 Observe the past week of behavior from investors toward the housing ETF in Chart 1. 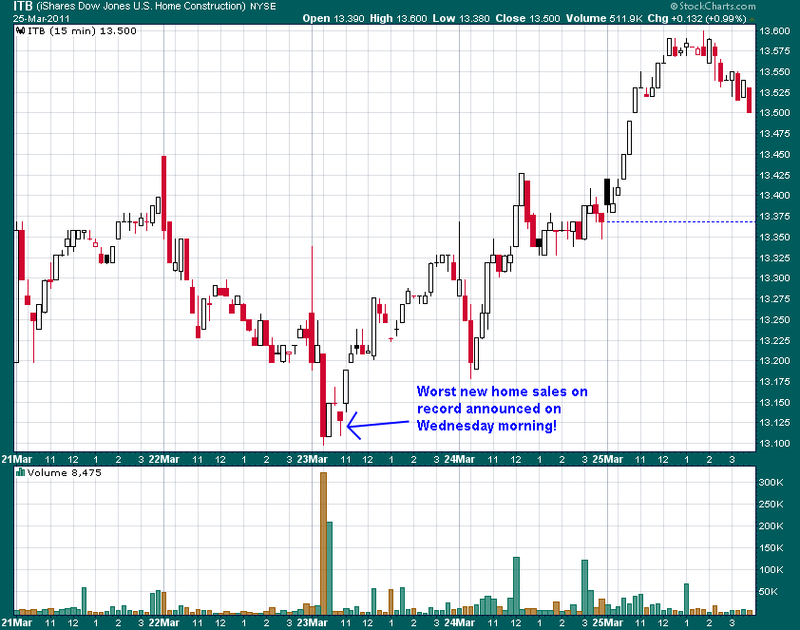 We can see that the housing ETF rallied strongly on the news of the worst sales on record. Yeah - I said ‘rallied’. Yeah - I said ‘worst sales on record’. I know readers have to be as giddy as me. Rule Ben wants a rally and a rally he shall have!! Reality be damned!!! Now observe Chart 2 below. 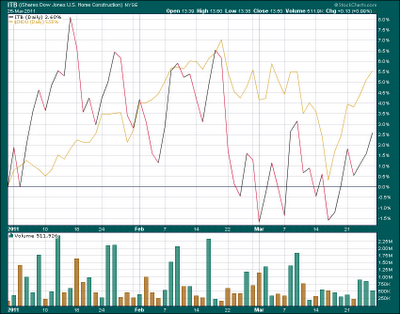 It is a chart of this same ETF, the ITB, along with the Dow year-to-date. Yes, crazy is coming into view now. As we can see from these two charts, it is obvious that the performance of an ETF is no longer a function of fundamentals. While the Dow is incredibly up for the year, so too is the ITB! In addition, we all know that housing and home building are rather large parts of our economy. Yet, our illustrious government has put forth fourth quarter GDP ‘revisions’ to reflect an upwardly revised rate of 3.1%. What does this mean. First, it doesn’t matter what we buy. Ben Bernnake’s magical quantitative easing machine blows bubbles in everything. Second, maybe we should buy the biggest pieces of garbage we can find. Hey, I hear GM actually sold a Volt car last week. They are on track to sell a few hundred this year!!! Maybe we should invest our money with a buggy whip maker. I wonder who makes leisure suits? What difference does it make. Buy, buy, buy! That’s what Ben does. Reality is meaningless. Crazy is in! Charlie Sheen hasn’t got a thing on the stock market! What else can go wrong? In the last decade, investors have withstood a barrage of seismic catastrophes along fault lines of vulnerability. Our political leaders have initiated military conflicts that were justified from prevarication and outright lies. It seems that all wars are fought on the foundation of a lie. Our same political leaders have initiated legislation known as the ‘Patriot Act’ supposedly in response to manifested threats. It seems the ‘Act’ was nothing more than a surrender of personal freedoms of the citizens resulting in a functioning autocratic government. The bullying, belittling, intimidation, and humiliation at the hands of the power-emboldened government effectively imposed submissive behavior on the citizenry. Our central banking system has served to promote the biggest bubble in history by employing the illusionary effect of wealth through real estate propagated by artificially low interest rates and non-existent standards of lending prudence. It seems the central bank is, as Andrew Jackson knew, an enslaving tool of the rich and a malicious plague to the poor. Our elected ‘representatives’ (Congress) have betrayed the electorate in the face of manifested financial crises as they surrendered the citizens’ Treasury to the banking cartel to use as it wished. TARPs, TALFs, and POMOs entered the lexicon portrayed as programs that would lead to ‘economic recovery’. It seems instead, this betrayal of duty has led to a constant state of spiraling debt. The US Constitution was written by the geniuses that were our forefathers and it was meant to serve as a foundation of our laws and individual rights. The treasonous Congress of the past decade have spent their time erasing those rights and subverting those laws so the plethora of lies told by government would not be exposed to the average citizen. When members of Congress walk by a statue or painting of Jackson or Jefferson, they should not even be allowed to cast their gaze upon them. Instead, they should affix their eyes to the floor and walk by their superiors in silent reverence. They are not worthy! It seems that when things get difficult, our laws and rights become problematic for a government dedicated to banking cartel servitude. The stock market has been ravaged by the ineptitude and greed of the Wall Street banking crowd. Their derivative scam came unglued and threatened to vaporize the government banking system. The government threatened the citizens with everything from depression to catastrophe. Falling stocks and falling real estate erased vast wealth from the hands of the citizens. It seems that the wealth lost by citizens was claimed by the banker elite. Their balance sheets were restored and the bonus shower resumed. Bankers have again resumed record profits! Yet, the average citizen now makes less than the average citizen in 1971. The real beauty of capitalism is it is indiscriminate about punishment. Corporations that lie, cheat, and steal are pummeled into bankruptcy by a free market when fraud is discovered. It seems, however, that capitalism had to be neutralized when it threatened to wipe away the banker frauds. Autocratic governments have been hoarding wealth and extracting it from citizens all over the world. Wealth concentration is only a problem when the citizens finally realize that their means are limited and their resources are rationed by the government that supposedly represents the citizens. So far, 2011 has been the year of riots born of disparate economics. It seems the citizens of every country are coming to the conclusion that their government does not represent them. The people are merely subjects. It is not surprising that there is a populous uprising across the globe. And now we have earthquakes pummeling countries and citizens. The latest (March 11) is the earthquake in Japan. The human tragedy is horrible and I have no intention of minimizing the suffering in Japan nor do I mean any disrespect. However, investors must digest all news as it relates to investing. But the truth is this. All of these events are fault lines to investors. They are investment changing events. Let me explain. Market based economies periodically have contractions. Free markets respond with bear markets. Central banks hate this idea because 1) they hate freedom, 2) they hate capitalism, and 3) they are arrogant enough to think they can better control economies and markets with their money printing machines. They have been orchestrating events since money was first issued to further their dominance and control. In the most recent decade, Fed Chairman Greenspan couldn’t let the bear market (that he brought on with bumbled monetary policy) of 2000 play out. There is a fair amount of evidence that the twin towers were brought down intentionally in part to cede more power to the Fed. They revived the economy with derivatives, free money, and credit that in turn, blew the real estate bubble until it burst. The Fed again assumed more power over the economy and the markets with the Pelosi Congress surrendering sovereignty to the central bank. Again, the bear market in stocks was the key. The citizenry apparently no longer has the intellect or courage to face bear markets and therefore surrenders to anyone promising an eternal ascent in prices. Unfortunately, the citizens are too ignorant to know for what they ask. The only way to perpetually spiral prices higher is to welcome and foment inflation. Inflation is the only answer the central bank has for anything. It is their specialty. So, to avoid bear markets in stocks and recessions in economics, the citizens have surrendered their power of price discovery, the virtues of capitalism, and ultimately personal liberty. 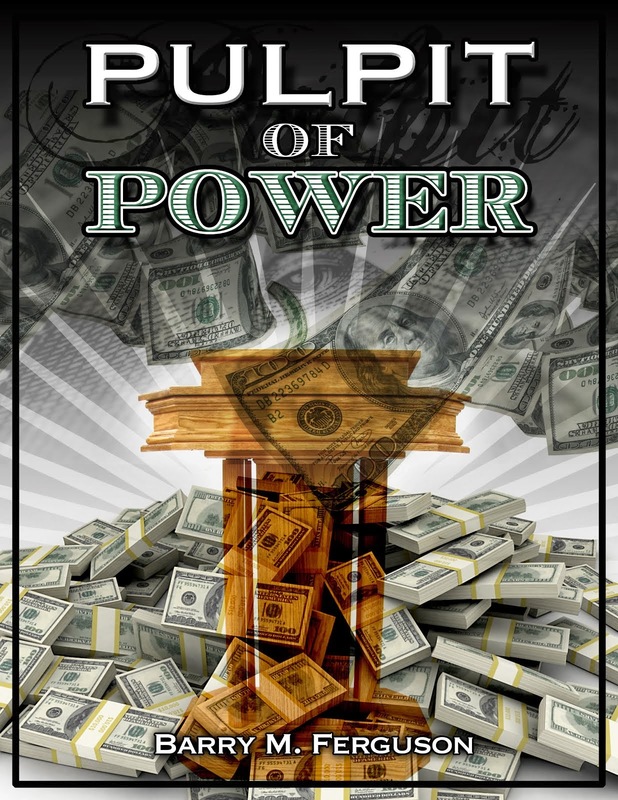 The central banks have assumed total control and as each fault line threatened to bring down their ‘house of cards’, they expanded their power. Each fault line has been met with intervention, both central bank and government, the likes of which has never been imagined. Now, we must entertain, at least, if not accept, that the central bank controlled government has expanded the HAARP program to include earthquake events. There is plenty of evidence that I am sure most readers have already digested. It is rather odd that the twin towers in New York and the earthquake in Japan both occurred on the eleventh day of the month. It is also rather damning that the HAARP wave has been turned on before several recent earthquakes. Whether we want to even believe in the program or intent of the program, we must acknowledge that many people in the world blame HAARP for the earthquakes in Chile, Haiti, China, and now Japan. We must also entertain the idea that given the quest of central bankers to control everything, they might employ absolutely anything at their disposal to cement their goal. Every fault line that threatens to topple the stock market is just another opportunity for them to grow their power over us. Let’s look at the central banker reaction to Japan’s earthquake tragedy. Again, the stock market is the key. 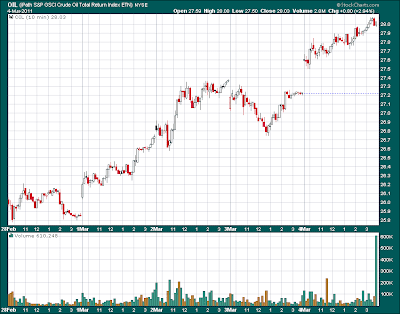 Ben Bernanke had set off a stock rally with his QE2 announcement on September 1, 2010. The Dow had hardly stumbled until riots broke out across the Mideast and Northern Africa. When the rioting expanded into Libya, the price of oil finally looked poised to push high enough to produce a drag on stocks. The Dow began to tumble. Bear in mind that under control of the central bank in QE2 mode, the Dow has hardly put together more than two or three down days in a row before resuming its rally. But this time was different. Yes, oil was firmly over $100 per barrel but the entire commodity complex was rising to painful levels. Incredibly, even the greatest propaganda machine ever on the face of the earth, the US Commerce Department, admitted that food prices were rising. Although, I think they did say something like excluding everything that grows on vines or branches or roots, there really wasn’t any inflation. In addition, it was also becoming apparent to anyone with a functioning brain cell that any economic activity that seemed positive since March 8, 2008 (a major fault line - the introduction of TARP and bailouts for all the ‘too big to fail banks’) was due to government/ central bank stimulus. To make matters worse, some of these central bank knuckle-draggers were talking about ending all stimulus with the end of QE2 in June. So, another fault line had to be manifested. This story is really about central bank control and not human suffering. The central bank doesn’t care about that. Their control is in their money that they issue in exchange for assets. They then devalue the currency and keep the assets. If they keep doing that until the currency is totally worthless, who wins? Yeah, I think we all ‘get it’ now! For instance, the central bank has used all the previous fault lines to develop the DTCC such that it clears derivative trading but also stock trades. If you don’t know, their name goes on the stock certificates that you buy with your money. They settled over a quadrillion trades last year alone. So, the key to the confiscation of assets is the currency. The central bank is not going to allow anyone to mess with their master plan. They have been devaluing the US dollar at a rather brisk clip of late and they need the Chinese and the Japanese to keep buying the US debt. Constantly increasing the debt works to devalue the currency. Of course, they also need brainless members of Congress to carry out the deficit spending that increases the debt but I think we all know they have that totally covered. The Chinese of course started the SCO with the purpose of moving to an alternative currency of the US dollar. Suddenly, the world is having a terrible problem with earthquakes. Coincidence? The central banks are determined to peddle their currency. Paradoxically, the more currencies weaken, the more central bankers grow their power. The earthquake in Japan served to strengthen the Japanese Yen because the re-building process will require a lot of yen. Thus, yen demand is expected to increase. However, the yen had already been on a tear mostly because of the declining US dollar. Since Japan is, to a large degree, an export driven economy, a strong currency can hurt the economic growth. All modern economic growth is built on debt. So, the BOJ announced a record yen injection into the financial system. That didn’t work. 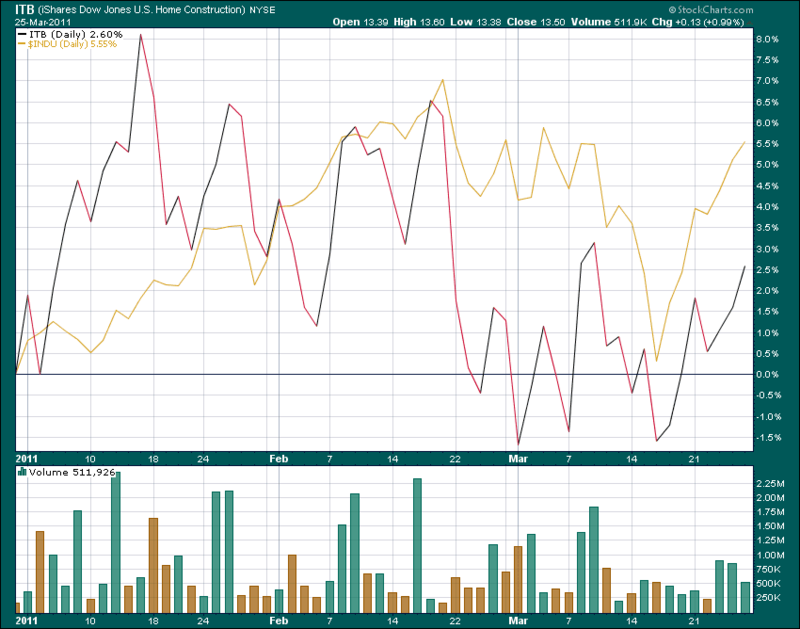 So, surprise - surprise, the Federal Reserve and other G-7 nations announced an ‘intervention’ to help devalue the yen. We must ask a question: Why do central banks always work to devalue currency that they issue? The answer is, they want to exchange their currency for assets but they also know the economies that they control are crap. The only way to make crap more expensive is to make the currency that it is denominated in less valuable. There you have it. As an investor, it is important to watch the Fed fault lines. 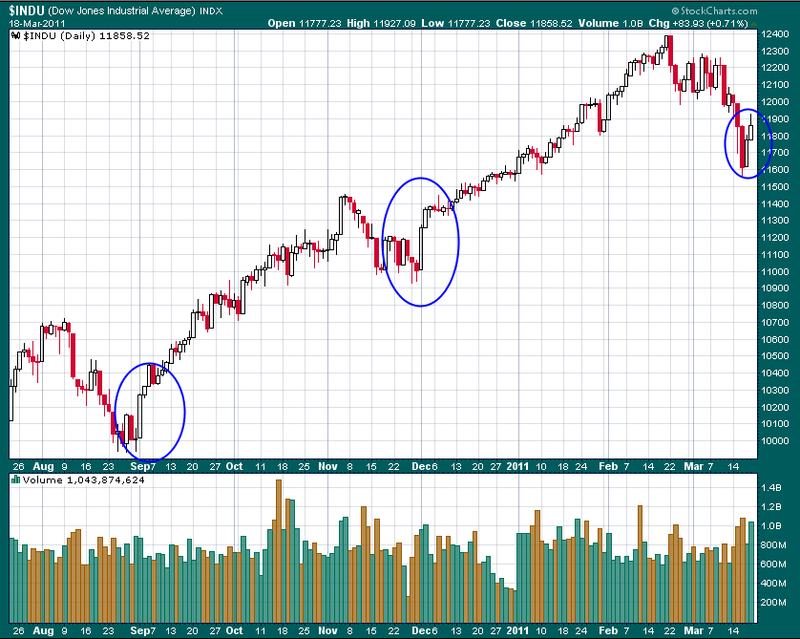 I included a chart of the Dow so we can see the turning points (blue circles) from these fault lines. The chart shows the markets response to QE2 and if the Fed has its way, we might see a similar response to the great ‘yen intervention’. Of course, we should be mindful that the fault lines could lead to down trends. Nah. The Fed rules the world now - earthquakes, economies, and stocks! Every trend change comes from a central bank intervention. If the trends go down, we all might catch on to their scheme. Fault lines now give the central banks the excuse to turn the stock trends up. War is ugly. War is brutal. War is hell. War is about creating carnage and withstanding carnage. Yes, sure - the military is all about war. Citizens around the world are waging war on their governments of deception. God only knows what is happening in Libya right now. Luckily for citizens of other countries in turmoil their governments are heavily in debt and therefore have spawned credit default swaps on banker balance sheets. Their governments can’t lay waste to the protesters because banker profits would be imperiled. Libya has no debt, no swaps, and no banker restrictions. A bloody battle will be allowed there. All that aside, the real war is for control of the stock market. Let’s take a look at how this past week played out. 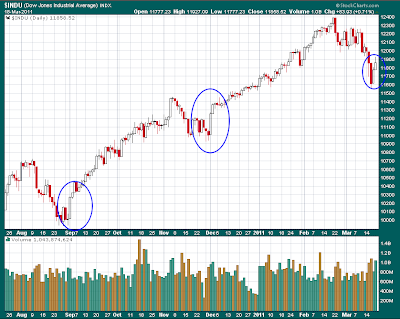 The first chart is a look at the DIA for the past five days with ten-minute bars. This is picture of war. There is enough doubt about the phony economic ‘recovery’ to go along with a market that has gone almost straight up since Bernanke’s QE2 announcement on September 1, 2010 to prompt some investors to sell off some of their holdings in the market. Not to mention, riots throughout the world have focused on the cruel effects of central banker inflation and the lie of the pension. (See my previous article on pensions at: http://bmfinvest.blogspot.com/p/pension-lies-lead-to-riots.html) There are indeed good reasons to take money off the table and hide. Central banker inflation has pushed oil prices over $100 per barrel and food prices threaten to put the world on a forced diet. The real fear might be that adjusted for inflation, food components are generally no where near their all-time highs and neither is oil. Inflation may have just now kicked in! But we know the rules of the grand ruler, Mr. Bernanke - DO NOT SELL! Let’s look at the chart. Monday muddled around. On Tuesday, sellers hammered the Dow down over 200 points with the selling continuing into Wednesday. Ruler Ben, you see, was sitting in front of the Village Idiots we call ‘Congress’ babbling and lying about who knows what. Why watch, right? Does anyone think he is going to tell the truth about anything? Does anyone think he has a clue about anything? Look at his record of prognostication over the past seven years or so. As mounting debt continued to drown the economy, he kept telling us all to enjoy the snorkeling. As we all know, when Bubbles Ben is away from the printing press, the markets sag. Indeed they did. He wrapped up his musings of insanity on Wednesday and was back at the controls on Thursday morning. And guess what? All the sellers from the previous two days were instantly buried with a furious buying spree fueled by..., well..., I’m sure there was some sort of ebullient ‘recovery’ news out in the morning. As we can see from the volume at the bottom of the chart, it was heavy. So Thursday finished with a the best single day gain in months. What a surprise! Mr. B must have slept in on Friday morning because sellers emerged right from the get-go and the Dow suffered a loss of about 180 points by midday. Of course, by now, we all know what happens on Friday afternoons when trading and traders are thought to thin out for the weekend. With the Dow down 180 points and the week threatening to go negative, we could hear the trumpets blaring. Ta-da, da, ta, da-da! Here they come, ladies and gentlemen. Let’s welcome the Plunge Protection Team! !Yes indeed. At their usual hour, 3:30 PM, they went to work. With a volume pattern and trading pattern eerily similar to Thursday morning’s jolt, the Dow enjoyed a 30-minute rally that gave it a positive slant for the week. Yippee! Saved again by the PPT! Yes, these are the same idiots that think they can terminate QE2 in June and have the market stand on its own. Stupid knows no depth. Let’s see if they continue the rally on Monday! With the heaviest volume of the week coming in during the final 30 minutes, I would think the PPT is determined to rally-ho! I mentioned that oil finished the week over $100 per barrel. 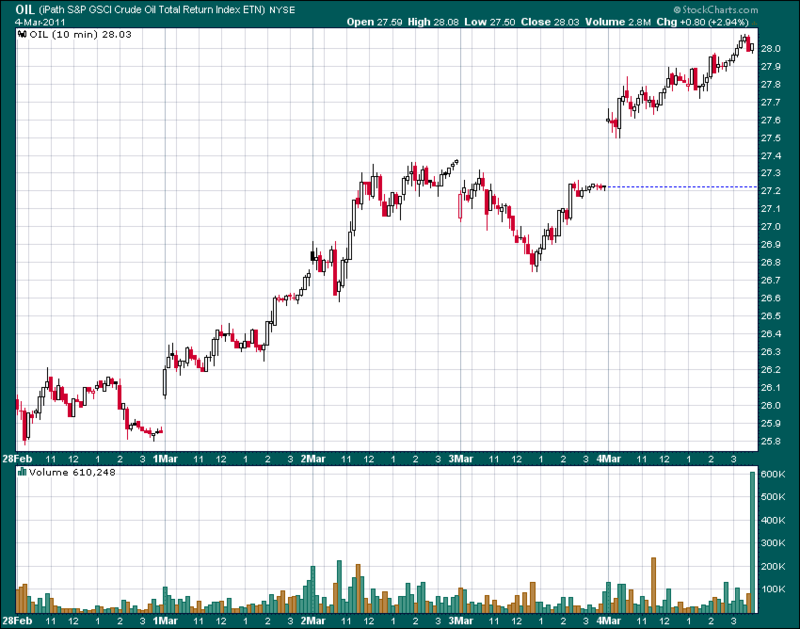 Here is a chart of the OIL ETN for the same time period as the above chart. Yes, I know that Bernanke testified that inflation was still a no-show but this is a man that challenges Cain in the book of Genesis for the biggest lies ever told. Or, he is the stupidest person ever to walk the earth. In either case, he should not be controlling our country. But he is. Oil is a reflection of his handiwork. 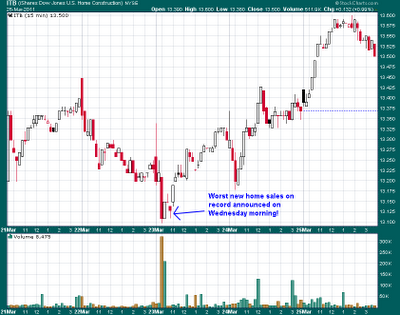 I am not going to belabor the point so what I wanted to point out was the final ten minutes of trading. Look at the volume at the bottom. For the day, the OIL traded 2.8 million shares. It traded 600k in the final 10 minutes of the day! Do you think traders were loading up on oil anticipating a nasty weekend of war across the planet? Bernanke and the central banks are waging war against would-be sellers of stock. It isn’t pretty. Selling is a losing proposition when the opponent has a printing press and a trading account at the NYSE. Let me leave you with one more thought. The ECB is talking about raising rates for the Euro next month. That action would likely further depress the value of the US dollar and in turn, increase the price of crude. Do what you will with that thought. But in the last 10 minutes of trading, a lot of traders have already decided what they want to do. War isn’t pretty. We just need to win.